OTTAWA — The pilots who fly Ornge's air ambulance helicopters may soon have a new skill to guide them through the skies — the ability to see in the dark. The province's medical transport agency, which suffered the fatal crash of a helicopter during a night flight in 2013, is poised to begin testing the use of night vision goggles by its pilots as a way to make flights after dark safer for crews and patients. Dr. Andrew McCallum, the president and CEO of Ornge, said the technology could be a "game-changer." 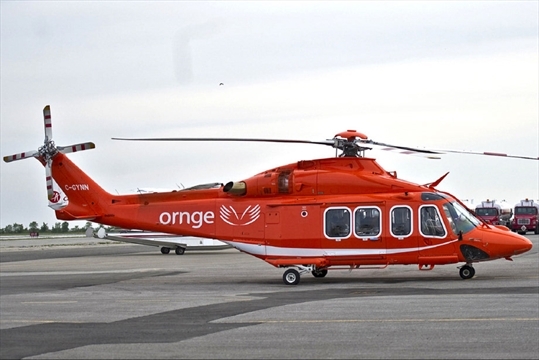 Ornge is now training its 11 helicopter pilots at its Sudbury base on how to use the advanced equipment and it has retrofitted an AgustaWestland AW139 helicopter. Once the training is complete in the coming weeks, the agency will begin a two- to three-month trial using night vision goggles, meant to aid flight crews during their nighttime flights, McCallum said. Helicopter pilots have told the Star that the high-tech gear could help prevent nighttime accidents by helping flight crews keep their "situational awareness" and avoid becoming disoriented when visual cues are lost. The agency is hoping the goggles mitigate the risks of flying in and out of so-called black-hole sites. These are landing sites, often in rural areas, where the lack of nearby urban lights leaves the pilots with few visual cues. Ornge relies on solar lighting to illuminate these sites at night, but the surrounding blackness can be disorienting to pilots during landings and takeoffs. Indeed, Sudbury was chosen as the site for the trial because it has many of these landing sites. The agency already has restrictions in place on night flights to these helipads, including weather limits and a requirement that pilots have recent experience operating at the site so they are aware of the topography and potential obstacles. "We obviously don't want to risk a crew," McCallum said. "We're very careful about that so the night vision goggles, we think, will be a game-changer in some of those places that are now subject to the black-hole illusion," he said. 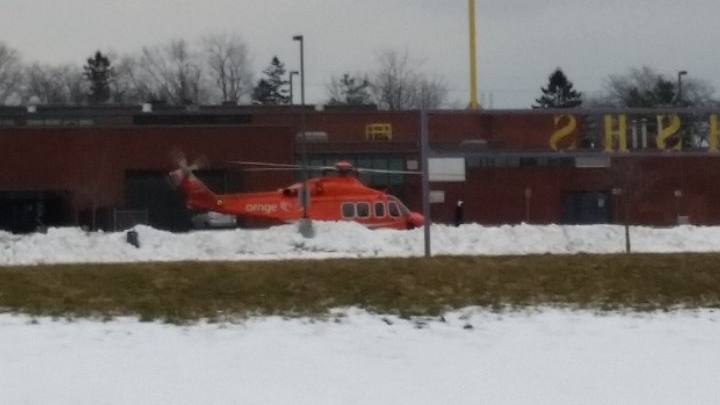 Concerns about night operations were raised by the midnight crash of an Ornge Sikorsky helicopter in Moosonee in 2013. It crashed soon after takeoff, killing two pilots and two paramedics including 38-year-old Chris Snowball from Burlington. The Transportation Safety Board of Canada has yet to issue a report on the accident. However, a separate probe by Transport Canada and Human Resources and Skills Development Canada issued a damning indictment of Ornge's operations. Among its conclusions was that Ornge had failed to ensure that pilots who operate by night visual rules in northern areas of operation are "provided with a means to ensure visual reference is maintained throughout the flight." A Jin Air flight bound for Busan was forced to return to Cebu, Philippines soon after taking off on Sunday due to safety concerns. According to Jin Air, an affiliate of Korean Air, the captain on Flight LJ038 decided to return to Cebu 20 to 30 minutes after takeoff as a loud noise was heard from the front door area. Some of the 163 passengers onboard complained of headaches and pain in their ears. "It seems that the noise was caused by wind coming through a small gap in the door, which had not been closed properly. An alarm signaled a problem with air pressure, so we decided to return to Cebu," a Jin Air spokesman said. An official at the Ministry of Land, Infrastructure and Transport said, "We will investigate the maintenance and operation records of the plane. If any regulations were violated, we will fine the airline." The ministry also plans to conduct thorough inspections of budget carriers' operations following a recent spate of safety glitches. 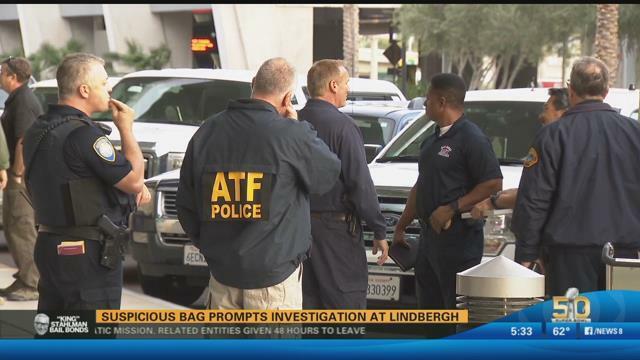 SAN DIEGO (CBS 8) - Operations at Lindbergh Field are back to normal Sunday night after a suspicious bag prompted an investigation. According to an airport spokesperson, during a routine inspection by Harbor Police, a canine alerted authorities to a bag at Terminal 2 West around 3 p.m. The area was corded off and the Metro Arson Strike Team was called in to investigate. After a brief inspection, no suspicious items were found and the area was cleared. 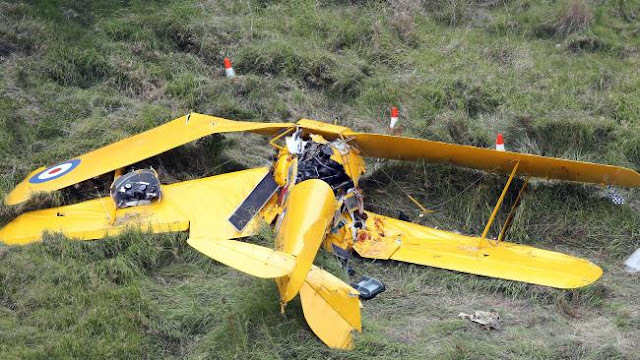 The future of Tiger Moth Joy Rides on the Gold Coast is up in the air as the owner of the Pimpama company suspends services until further notice. 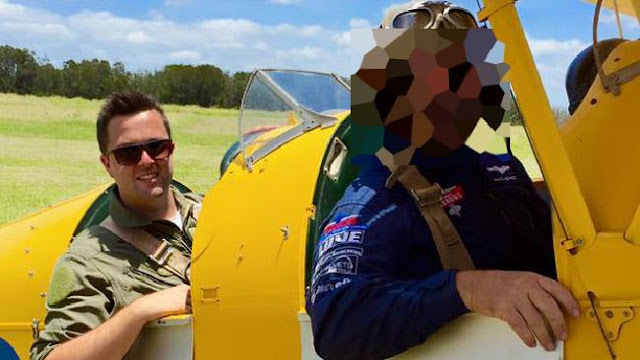 The fatal crash last Monday, which killed Coutts Crossing train driver Gary Turnbull, 58, and injured world record breaking pilot Ryan Campbell, 21, destroyed the only warbird owned by Paul Bennet, of Paul Bennet Airshows. Mr. Bennet refunded bookings scheduled for the summer holidays and said the most professional thing to do at the moment was nothing, out of respect for the deceased. “I have no answers,” he said. “We’ve refunded all the bookings, there was no issue with doing that at all. “It’s just still a bit raw. I need to have a think about everything. “A lot of what we end up doing will depend on what the findings are. “It’s just too early to tell, an accident has happened and we need to put business decisions on hold to make a proper decision. 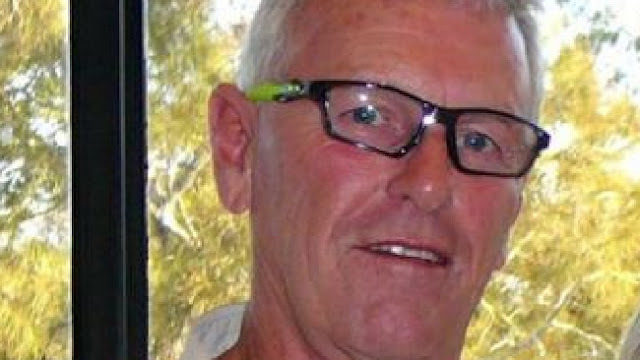 Gary Turnbull was killed when a deHavilland DH-82A Tiger Moth plane crashed at Pimpama. There were reports pilot Mr. Campbell, who is still recovering in Princess Alexandra Hospital, said the crash was a result of an engine failure but that is yet to be confirmed. The Australian Transport Safety Bureau are investigating the incident and will pass their findings onto the Civil Aviation Safety Authority, who then decide whether the pilot is fit enough to keep his license. Mr. Campbell had wanted to be a pilot since he was six-years-old and has a family background in aviation. “It’s too early to make judgments on that (licensing),” a CASA spokesman said. Pilot Ryan Campbell (left) in the Tiger Moth. He is recovering in hospital. Tiger Moth Joy Rides only relaunched in May after the business was taken over by Mr Bennet following a fatal crash in December 2013 that claimed the life of young Frenchwoman Taissia Umenc and pilot Alex “Jimmy” Rae. An investigation into that has not been finalized, although an initial report found the left wing had failed soon after commencing an acrobatic maneuver off South Stradbroke Island. Former owner Geoff Stillman, who decided to sell the business after not quite bouncing back from the fatal crash two years ago, was not available for comment. 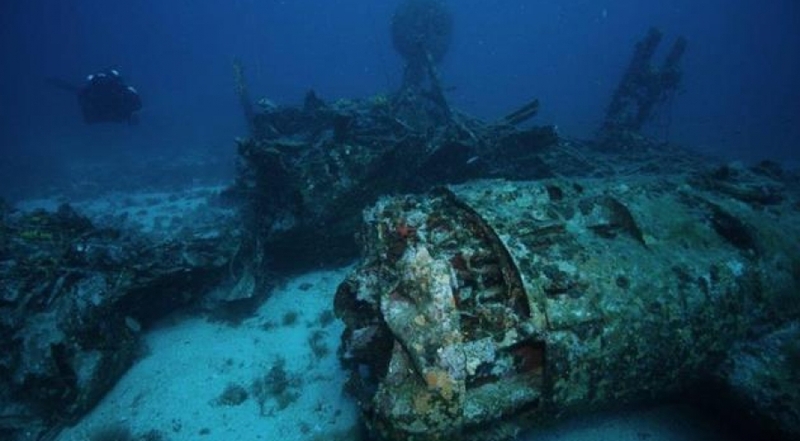 There have been about a hundred sunken aircraft, mainly from World War II, found in the Adriatic Sea, while the number of sunken vessels from antiquity to the present day is over a thousand. Since on the island of Vis in 1944 there was an Allied airport with only one runway, while the skies above Vis were full of aircraft waiting to land, sometimes the planes would run out of fuel and end up in the sea, reports Slobodna Dalmacija on January 3, 2016. Therefore, in the waters around Vis, about 30 aircraft have been found, mainly bombers and fighters from World War II. The latest in a series of discoveries happened in the sea near the southern part of the island, when a diver in 2009 discovered the remains of a B24 heavy bomber (pictured on the photo) at a depth of 39 meters. Croatian Conservation Institute formed a professional team which explored the wreckage. Although the tail with the aircraft serial number has not been found, according to data from the American archives it seems that the plane successfully completed 27 assignments before going down. It fell near Vis in December 1944, with seven out of ten crew members being rescued. And just when everyone thought that no more aircraft will be found, Siniša Ižaković, an experienced diver and diving instructor and the owner of the ISSA Diving Centre in Komiža, confirmed the news that in waters near Vis another aircraft wreckage, most likely B24, has been recently discovered. "The information is accurate. Based on an interview with a fishermen from Komiža, last month I dived and found the wreckage of an aircraft at the location on the western side of the island of Biševo, at a depth of 85-90 meters. It is probably a B24 aircraft. Due to poor visibility in the first few minutes I was not even sure if it was an aircraft. Only later did I notice an airplane wing and turned the light on in order to better film the plane. However, that proved to be a mistake and has unfortunately destroyed most of the shots. I am still waiting for the confirmation from experts", Ižaković said. He also added that next dive is planned for the beginning of the next season, in March or April. After the serial number of the aircraft is found, it will be possible to determine the aircraft's story, who members of the crew were, where did it fly and many other information about its history. NEW HAMPTON - State police stopped a Laconia driver after a trooper riding aboard a police aircraft says he clocked the car going 105 mph in a 70 mph zone on Interstate 93. 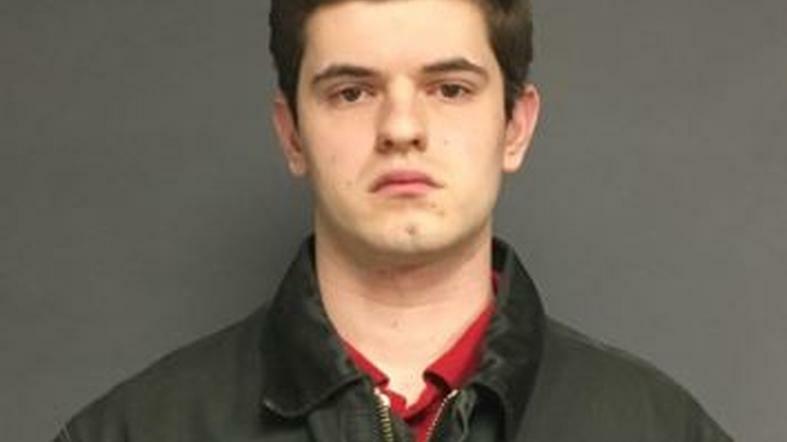 Police stopped Paul Kimble, 21, heading north on the interstate and charged him with reckless driving on Sunday morning around 10:30 a.m.
Kimble is scheduled to appear in Laconia District Court on Feb. 25. 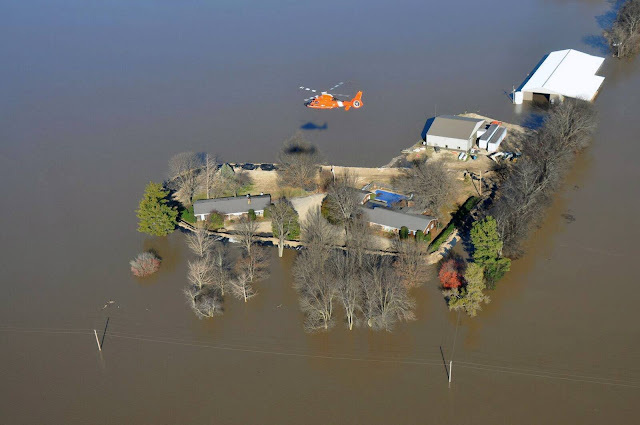 WPBN/WGTU — An aircrew from the U.S. Coast Guard Air Station in Traverse City is helping with the recovery efforts needed after the historic Midwest flooding. The aircrew is flying along the Mississippi River near the Missouri, Illinois and Kentucky borders. The aircrew joined a combined local, state and federal effort for a search-and-rescue, mapping and logistics efforts. 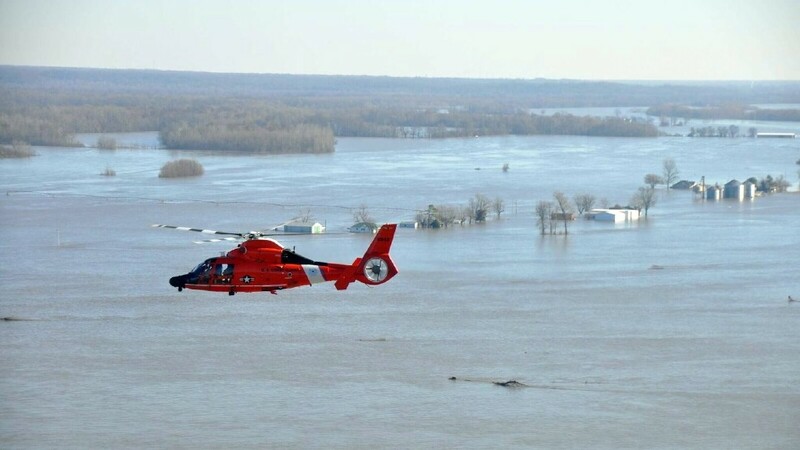 The U.S. Coast Guard has devoted several air and surface assets to the prevention and recovery efforts along the Mississippi River's communities. 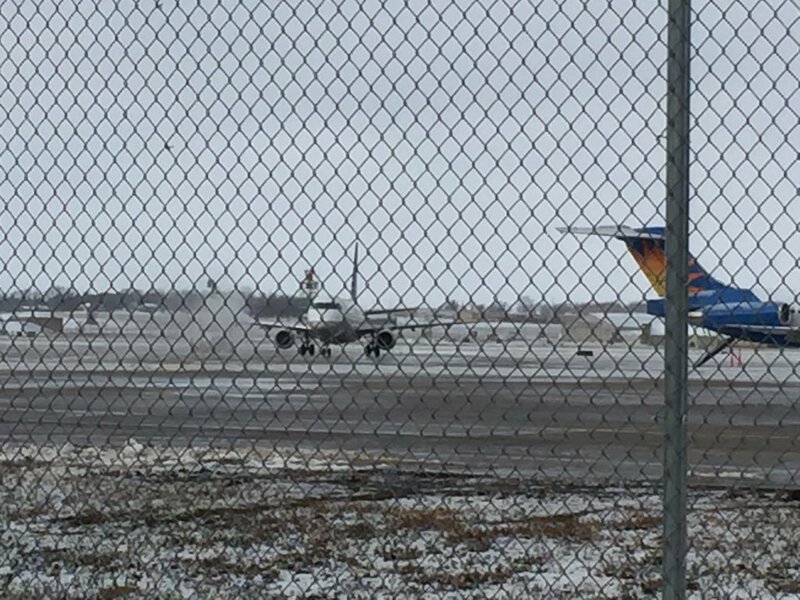 LUBBOCK, TX -- A small plane made an emergency landing at Lubbock Preston Smith International Airport Sunday afternoon, according to the Lubbock Fire Rescue and the Federal Aviation Administration. Lynn Lunsford, Mid-States Public Affairs Manager with the FAA, tells EverythingLubbock.com the Cessna T210H landed gear up at the airport. Nine Lubbock Fire Rescue units responded to the airport around 3:30 p.m. The plane made a hard landing on the north-south runway, according to Lubbock Fire Rescue. Rescue 5 arrived on the scene first and reported that all three people on board were safe and out of the aircraft. All other incoming emergency units, including UMC EMS, were cleared away from the scene by 3:45 p.m. and no fuel leaks were reported. The incident is currently under investigation by the FAA. FAA records show the plane is registered to Kenneth W. Isom of Idalou. The Federal Aviation Administration is investigating after a plane landed with its landing gear up Sunday afternoon at the Lubbock airport. Three people were on board when the single-engine Cessna 210 landed with its landing gear up at its final destination of Lubbock Preston Smith International Airport, said Lynn Lunsford, a spokesman with the FAA. The hard landing occurred at 3:33 p.m. and by 3:45 p.m., Lubbock Fire Rescue had responded and said the situation was under control. EMS was not needed since one was injured, but the FAA will investigate. 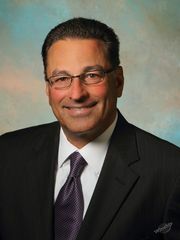 Rick Nini is the owner and president of Corporate Eagle, based at the Oakland County International Airport in Waterford. As a boy, Rick Nini was fascinated with flying. He was inspired, he said, by the NASA space program, and at 12 or 13, his parents put him on a new, commercial jet to fly by himself from Michigan to California to see his aunt, uncle and cousins. In high school, he found a way to get flying lessons — even though his family couldn’t afford it — and before long he had a pilot’s license and was crisscrossing Michigan. First, flying canceled checks, then, passengers. From there, he took over a failing flight school, Tradewinds Aviation — and then started his own company, Corporate Eagle. The 54-employee company, which was started in 2008, is based at the Oakland County International Airport in Waterford. It has has 12 planes, 9 of them are jets, and 29 pilots. It was on track to have revenues of $22.8 million. And while he doesn’t have a college degree, he said he requires all his executives have one. Falcon 2000, one of the planes in Corporate Eagle's fleet at Oakland County International Airport in Waterford. Question: So in your senior year, junior year of high school, you got a job at an airport in exchange for flight lessons? Answer: I started in June or so, coming out of my junior year before my senior years. That summer, I got the job. I was really into becoming a pilot. I loved aviation and read about it all the time. My dad took me out to Detroit City Airport. I met a pilot out there, and I told him I wanted to be a pilot and he sent me out to this Commander Flight Academy. He said go see this guy, the owner of it. And I drove out there on a Saturday, and he happened to be there, the owner. I told him, “I want to be a pilot, I want to sign up.” He proceeded to tell me how much it cost to become a pilot and enroll in the academy and do everything. He might as well have told me $10 million. I turned around, walking away, and he said: “How would you like a job here?” He was getting involved in buying and selling small planes. He hired me. I started Monday. It was an opportunity. A door opened. I walked through it. I went there every opportunity I could. Q: After you became a pilot, you flew canceled checks? A: That was a big deal. Back then, when these banks closed they had to get the paper check to the Federal Reserve to get credit. So I would literally leave 5 o’clock out of Gaylord, go to Alpena, pick up bags of check from different banks. They were in big, clear plastic bags, bundles of checks. Come back to Gaylord, pick some up, Traverse City, Saginaw, and then go to Detroit and dump them all. We had a driver that met us. Then, I’d take off again, and got to Lansing, Grand Rapids, South Bend, and then Detroit. Q: What did you do after that, your next job? A: I was really young, and they put me on this canceled check deal. But, they also flew passenger charter and they had a guy call in for a trip. It happened on a day off and I was the only person who could fly it. They were nervous putting me with him. I was 20 years old, but I looked younger than that. They told me how to do it. How to act. I got a plane flew this guy. He needed to go to Gary, Ind., and they put me on it. I flew him. He liked it, and called for another trip. They gave him another pilot, and he didn’t like him as well. He called again and he asked for me. I started flying him on a weekly basis, and he said, I’m going to buy a plane and I’m going to hire you. That’s how I got my first corporate flying job. Q: How does Corporate Eagle work? A: We fly for 39 members today. All southeast Michigan members, successful business people and businesses. And we do a managed program in which we have four wholly-owned managed airplanes. And then we have eight airplanes in our fractional program. That’s where a company can buy or lease a quarter share and that allows them so much access to the plane. Q: So it’s like a time-share for flying? How much does it cost, roughly? A: We have the King Air, our turboprop airplane. 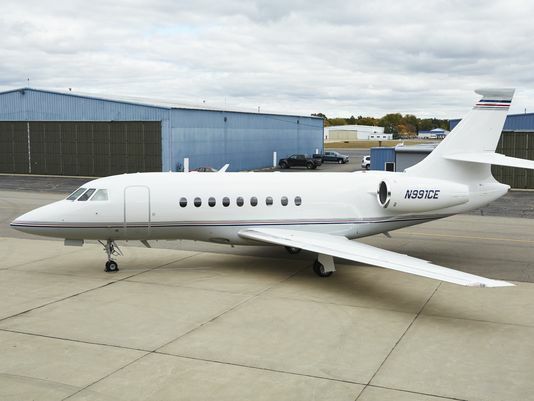 We have a Hawker 800XP, our midsize business jet, and we have a Falcon 2000 program. Right in the middle, the Hawker program, the smallest share we do is an eighth. It’s $485,000 to buy an eighth of that airplane. You go on the title and you own it — or you can lease it. An eighth share, 50-hour user, will probably spend another $240,000 a year between management and user fees. They are guaranteed 46 days a year, and they can have any days they want — no blackout days. Q: What advice do you have to give to other executives? A: The success of my company has been the stubbornness to stay the course — staying with my business model has been important. Another thing, is you have to surround yourself with really, really good people. I have a great team, and — it’s funny — everybody on my team I require a college education. The armed forces found the wreckage of a suspected drug smuggling plane from Bolivia that crashed while trying to land on a clandestine strip in the Peruvian jungle, army Gen. Cesar Astudillo said Sunday. The accident occurred on Saturday near Puerto Ene, a town in southern Peru's Valley of the Apurimac, Ene and Mantaro Rivers, or VRAEM, where about half of the country's illegal coca crops are grown, Astudillo told Radio Programas del Peru, or RPP. Residents assisted the plane's crew, who fled before the armed forces arrived at the accident scene in a helicopter, the army general said. The plane lost a wing and security forces members took the aircraft to the VRAEM Special Command's base in Pichari. Investigators found a GPS system and radio equipment inside the plane that will help them as they work the case, Astudillo said. The Shining Path guerrilla group's remnants operate in the rough terrain of the VRAEM, an area that has been under a continuous state of emergency due to its status as one of Peru's largest illegal coca-growing regions. An estimated 18,845 hectares (46,530 acres) were planted with coca, the raw material for cocaine, in the region at the end of 2014, the United Nations said in a report. Jackson Hole Airport closed shortly Saturday night due to a reported runway excursion. Jackson Police Department said a private aircraft had run off the end of the airstrip, but no emergency response had been called in and no injuries had been reported. Airport Director Jim Elwood gave a similar report, as did a spokeswoman at Jackson Hole Aviation, the fixed-base operator at the airport, who said the plane blew a tire on landing. No other damage to the aircraft was reported. The Jackson Hole Aviation spokeswoman said the aircraft was being towed out of the snow, and Elwood said operations at the airport were expected to resume soon. JACKSON, Wyo. — No major damage or injuries have been reported after a private plane ran off a runway at Jackson Hole Airport on Saturday night. The Jackson Police Department says the plane ran run off the end of the airstrip. The airport was closed while the aircraft was towed out of the snow. According to the Jackson Hole News and Guide, airport officials say the plane blew a tire on landing. 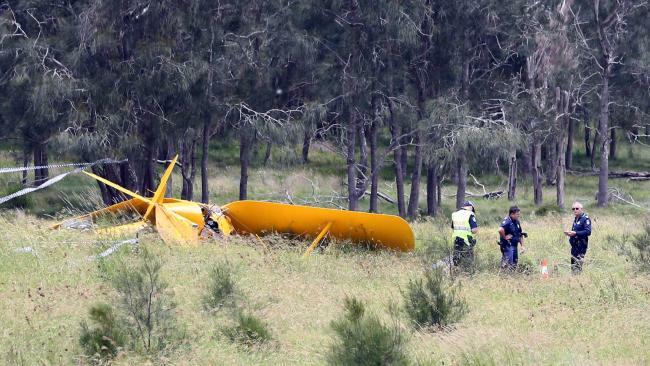 The pilot and passengers have not been identified. 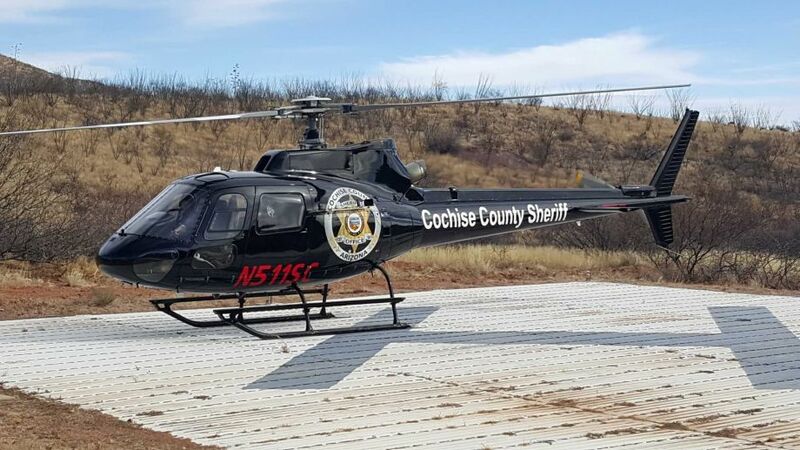 This December 2015 photo provided by the Cochise County Sheriff's Office shows a new helicopter nicknamed "Geronimo," used by the sheriff's office in Benson, Ariz. The launch of the new chopper comes one year after a fatal crash in which two people were killed while operating helicopter leased by the sheriff’s office. TUCSON, Ariz. (AP) — The Cochise County Sheriff's Office has launched a new helicopter one year after the one it leased crashed, killing two. The New Year's Eve 2014 crash near Benson left a Navy veteran and retired police officer dead after the team was returning from getting routine maintenance in the Phoenix area and encountered bad weather. The sheriff's office is now working with a new leasing company and will be using a new helicopter that's much bigger and has more capabilities, spokeswoman Carol Capas said. Capas said the department had been relying on air support from federal and state agencies and that having its own unit will be extremely helpful in such a large and sparse county. It was particularly difficult for deputies who had to respond to remote areas that take too long to get to on car, she said. "With our air support we are going to be able to launch at any given time and we're gonna be able to get there much quicker in some cases," she said. The helicopter will also be used for emergency situations. For example, Cochise County sits on the border with Mexico and is regularly used by drug smugglers. The Howard G. Buffett Foundation is covering the entire cost of operating the helicopter for the first year, Capas said. Capas said that the agency will review the air program at the end of the year and that it doesn't have funds to support it on its own. The operator reported that the helicopter had not arrived at its destination and that the Sky Connect Tracking System indicated that the helicopter was at a stationary location between Tucson and Benson. The Cochise County Sheriff located the helicopter wreckage about 2030 at the location the Sky Connect system was reporting. The helicopter was fragmented into multiple pieces along a 174-foot-long debris path. Witnesses living in the local area reported hearing a low flying helicopter around the time of the accident, and that the visibility at ground level was very limited, with low clouds and fog. A deal with Vietnam Airlines could help a Christchurch flight school to train more students from Asia. International Aviation Academy of New Zealand has won approval to train Vietnam's commercial airline pilots. Academy chief executive Peter Randle said Vietnam was like much of Asia in that its airspace was controlled by the military. There was no private air-training in Vietnam and no other commercial career options like aerial top-dressing, taking tourists for joy-rides or "banner-flying along the beach." Asian students mostly trained in the United States, or increasingly in Australia or New Zealand. Randle said International Aviation expected to take about 30 Vietnamese pilots a year, training them for up to 18 months. About three months of their stay in New Zealand would be for English lessons, which they would need to sit up to 15 exams and do up to 1400 hours of flight training. Randle said it would cost each student $90,000-$100,000 to come to New Zealand, plus $20,000 in accommodation, transport and other extras. The academy, based at Christchurch airport, was currently training up to 100 foreign and domestic students a year but could handle up to 130. Vietnam Airlines and a training school in Vietnam that it half-owned would provide about five groups of students a year. It would be cheaper for International Aviation to take students through an airline partner than to hire recruiters to chase 60 to 80 individual overseas students, Randle said. Training 30 foreign students a year would be big by New Zealand standards, he said. Vietnam needed to train about 200 students a year for the next five years, although only some of them would ever come to New Zealand. Training was still cheaper in the United States. International Aviation, which started in the mid 1990s, was one of only two in New Zealand that was "active" in targeting international training. It received some government funding to train New Zealand citizens but overseas students had to pay their own way. The school also had approval from airway authorities in India and Sri Lanka to train pilots but had yet to agree on training with airlines in those countries. The academy sealed its Vietnam deal in November with a sign-off by tertiary education minister Steven Joyce, who joined Prime Minister John Key on an education sector delegation to the country. Randle said Air New Zealand approving it as an international flight trainer three years ago helped the academy prove its credentials in Vietnam. Bryan Marr operates one his drones used for commercial purposes. The proliferation of drones has some wondering if local regulations should be enacted to ensure proper usage and others' privacy. As the drone industry takes off, the technological marvels have become increasingly affordable and under greater surveillance by federal regulators. Drones could be purchased for as little as $25 to thousands of dollars depending on their capabilities. An estimated 400,000 were given as gifts this past Christmas. Yet, just because drones can be flown as toys or for a hobby doesn’t mean they’re flying under the radar. The Federal Aviation Administration requires all small drones, those weighing between just more than half a pound up to 55 pounds, be registered by the owner, who also must place a registration number on the drone. Registration may be done online at faa.gov/uas/registration. It costs $5 to register one. If used properly, drones can provide hours of recreation, but they also raise concerns that, used improperly, they can cause a safety hazard and possible invasion of privacy. To use his drone commercially, Marr needed a certificate of authorization and has to send an email every month to the FAA, identifying where his drones have flown and to notify the agency of any upgrades or incidents, such as a crash. Those requirements are not required of enthusiasts, who greatly outnumber commercial users. Marr said a pilot’s license is required for his work. He brings a pilot with him on all jobs to operate the drone as he works on his own license. The drone also must stay within the operator’s line of sight. Rules for hobbyists include keeping the drone within the line of sight, keeping the drone below 400 feet and at least five miles from airports and not flying them near populated areas. Marr also warned that some lower-end drones become confused and follow a different WiFi signal, causing the owner to lose sight of it. Al Hamilton is another drone enthusiast and has helped organize classes for those wanting to know more about their drones, how to operate them and safety issues. “My main concern was when I knew there were more drones out there,” he said. “I’m trying to educate people with drones on what you can or can’t do. 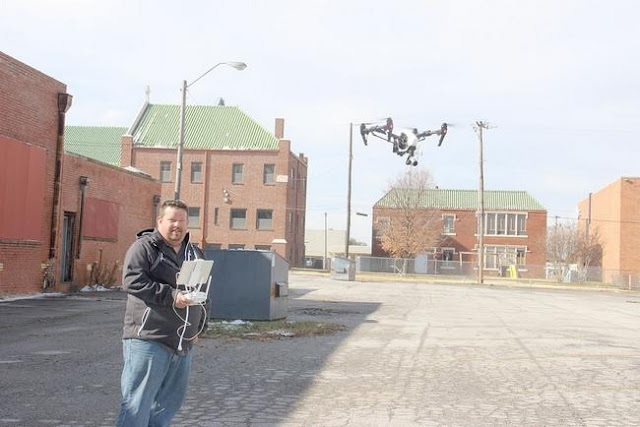 Hamilton, like others, is amazed that drones have grown in popularity almost overnight. Ardmore City Manager J.D. Spohn said the city does not have anything on the books regarding drones but that doesn’t mean they won’t be monitored for possible regulation. For the past two years, farm rent produced at the Huron County Airport has been a source of controversy. The county/airport rents land to a local farmer, who, in turn, pays rent. The Reflector requested the amount of farm rent paid to the county on airport property from 2013 to 2015. Huron County Auditor Roland Tkach, upon that request, reported about $35,000 has been paid to the county for farm rent at the airport. Tkach also said he saw no records of the commissioners then forwarding that money back to the airport. Harry Brady, airport board president, said Wednesday he hopes in 2016 the airport coffers will receive the farm rent, considering it is produced on airport ground. Huron County Commissioner Tom Dunlap said this week the subject of farm rent will be discussed by the board in the new year. Brady said the airport could use the $35,000. “Most of that would go toward the grant match for next year,” he said. “We need to replace the tarmac in front of the commercial building and might have to add another access or taxiway to the runway. Brady said there is a legal opinion from the prosecutor that states the farm rent should be allocated to the airport. ”But, I’ve been told that isn’t enforceable,“ he said. What about going to a judge? Brady said he hasn’t considered going to court for the farm rent because the airport board is trying to develop a positive relationship with the commissioners. State Rep. Terry Boose (R-Norwalk), who served as a Huron County commissioner from 1997 to 2004 and is running for commissioner in 2016, said this week the current commissioners should turn over the farm rent to the airport. “If I’m a county commissioner and I’m asking the airport to be self-sufficient, it’s not fair for the county to take the money from the farm rent,” Boose said. More than £2,300 has been paid out for damage from low-flying RAF aircraft in Lincolnshire - including a broken chandelier. A face and neck injury and dislodged roof tiles are also included in the three separate Lincolnshire compensation claims paid by the Ministry of Defence. It spent a mammoth £374,895 on claims involving low-flying aircraft during the 2014 to 2015 financial year. The biggest payout in Lincolnshire was £1,262 for a face and neck injury caused by a Tornado. A damaged patio door and chandelier cost the MoD £780 in a second Lincolnshire claim, after "sonic incident" caused by a Typhoon. Another sonic incident resulted in a third payout of £275 for dislodged roof tiles. The figures come from a Freedom of Information request made to the Ministry of Defence. In its reply to the request, the MoD states: "The MoD takes the issue of safe low flying extremely seriously and understands that military low flying can be noisy and unpopular, but it is an essential part of operational training." It said it tries to "keep such disturbance to an absolute minimum". It also said there is a Low Flying Complaints Enquiry Unit at RAF Wittering, which allows people to report any low flying incidents that they feel concerned about. According to the figures, the largest 2014/15 payout was for "the loss of poultry and egg production" after an incident involving a Chinook in East Sussex. A similar claim, again in East Sussex and involving a Chinook, resulted in £30,648 being paid out. More than £20,000 was paid for the loss of a calf in Co Amargh, in Northern Ireland. Other claims included loss of gamebirds and birds of prey, injured cattle and horses, damage to cars and even tents. Personal injuries also include hurt wrists and hands, whiplash, and hip and back injuries. 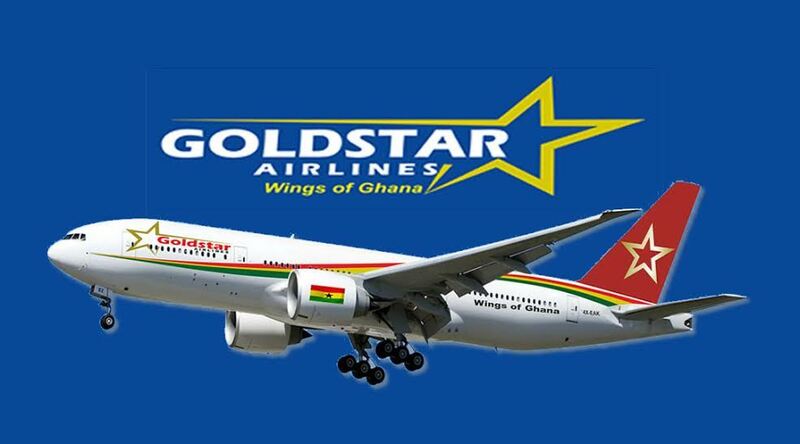 Goldstar Airlines, a Ghanaian airline company will set in motion a recruitment exercise to recruit Ghanaians as cabin crew for its aircrafts. The company as part of efforts to indigenize its airline operations will engage and rely on Ghanaians to man the aircraft which will touch down in no time. Towards this end, the airline will roll out a scheme to invite applications from qualified Ghanaians to apply for the position of cabin crew to take care of the passengers on the aircraft in flight. The objective of the airline is to promote and protect the interests of Ghanaians. In view of this, Goldstar Airlines, will roll out special programs tailored to the needs of the aviation and tourism sectors. Again the company will deliver promptly on its promise of getting Ghanaians and other nationals to the destinations such as London-Gatwick, Baltimore-Washington and Guangzhou-China and connecting them to some of the West African countries with the view to promoting and building national network. Goldstar Airlines is committed to working actively to promote national network and unity of purpose as a local host, will open up possibilities to get a feel of Ghanaian right from boarding the aircraft till when it will touch down at the designated destination. The company’s pride and joy will be to empower and equip the Ghanaian to pursue economic ventures in the aviation and tourism sectors. In a statement copied to Ghanaweb, the public relations officer, John Ashong-Mettle, indicated that the company will give credence to its mantra of indigenizing its operations. Owing to this, the company is flying down a cream of experts to train those who will make the grade after the interviewing exercise to put them through their paces to learn the tricks of the trade. He added that when the airline company gets off the ground it will rely on expatriates as the cockpit crew but will unfold a tailor-made course of study to be undertaken by some Ghanaians who will be sent abroad to train in order to get or have a handle on piloting the Boeing 767 series which Goldstar airlines will be using. After the training, the trainees will do a period of apprenticeship with the expatriate pilots to get hands-on experience and knowledge in line with the company’s plan of replacing the foreign pilots with Ghanaians.” he stressed. He also enumerated that the company is ready to respond to persistent call on individuals and corporate bodies to partner government in reducing and eliminating the unemployment canker in the country. Fighter pilots would be offered psychological help if they were ever forced to shoot down a passenger plane in the wake of the September 11 terror attacks, according to a newly released report by MPs. It revealed how the Government had prepared a contingency plan for what to do if a plane was hijacked over the UK. 'Being ordered to shoot down an airplane which is full of civilian passengers and within visual range is, in our view, likely to be an extremely traumatic experience,' said a report by the Commons Defense Select Committee. Typhoon jets are ready to be deployed to intercept such a threat 24 hours a day as part of the RAF's Quick Reaction Alert. The jets, which are based at RAF Coningsby and Lincolnshire, are equipped with two 2,000-litre tanks, four short range air-to-air missiles and four advanced medium range air-to-air missiles. Since the September 11 attacks, in which almost 3,000 were killed, the Typhoons are said to have been scrambled on dozens of occasions to intercept passenger planes which had either deviated off course or lost contact with air traffic control. The report expressed deep concern that while pilots had received little to no training in the event that they harmed or killed civilians in an attack. It said: 'They are trained to intercept and shoot down enemy military aircraft. They - or their colleagues - are also trained to attack targets on the ground and to do so in the knowledge that, however carefully chosen those targets are, collateral civilian casualties cannot be ruled out. 'But those are both very different things from asking them to shoot down a hijacked civilian passenger airplane very probably on a flight to or from the UK itself. 'We asked what support MoD and the RAF were providing to the air crew who might be faced with such a task. 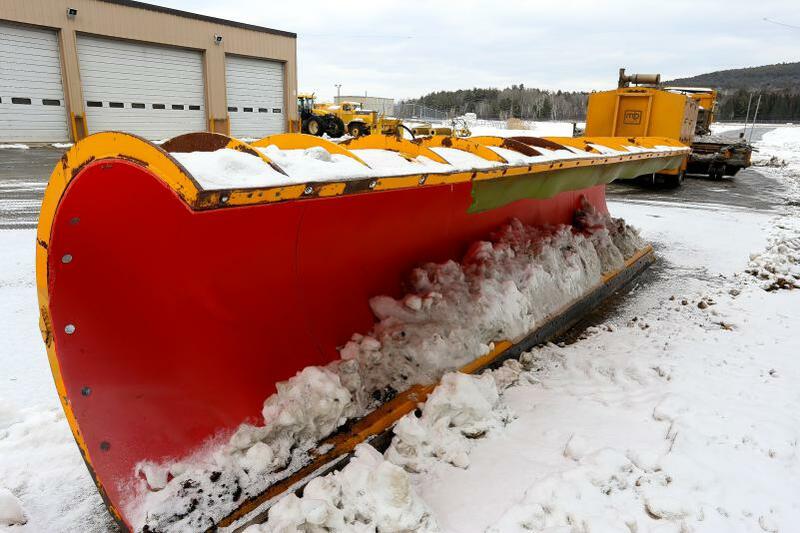 Snow removal equipment is stored outdoors at the Lebanon Municipal Airport in West Lebanon, N.H., on January 2, 2016. A $34.9 million consultants' proposal includes a larger building for the airport's maintenance equipment. 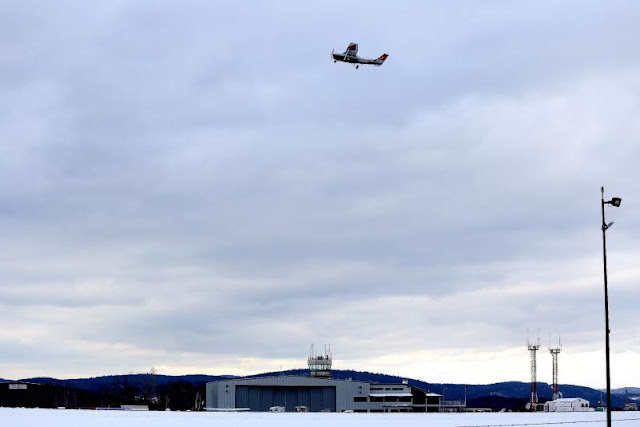 A private plane takes off from Lebanon Municipal Airport in West Lebanon, N.H, on January 2, 2016. A public forum is to be held on Tuesday, January 5, 2016, to get feedback on a $34.9 million proposal to improve the airport, including the construction of two hangars to accommodate larger aircraft. Lebanon — Cape Air marked its fourth consecutive year of hitting its target of 10,000 people leaving from the Lebanon Municipal Airport, the company announced in a news release last week. While the airport’s usage has remained relatively steady since 2012, the airport itself — its noise, lights, environmental impacts and cost to taxpayers — continues to be controversial. In order to formulate a community-supported plan for the airport’s future, the city has hired consultants to lead a $400,000 master planning process. Since then — with the city’s vision in mind — consultants from Binghamton, N.Y.-based McFarland Johnson have put together a collection of possible improvements to the airport’s runways, taxiways and buildings. The improvements would address goals such as improving runway safety areas — the space surrounding ends of both runways necessary to reduce the risk of damage to aircraft — maintaining runway lengths of 5,500 feet, improving the surface of the runways, taxiways, parking lot and Airpark Road, expanding the snow removal equipment building and the aircraft rescue and fire fighting building and allowing for the construction of two new hangars to generate revenue to support the airport, according to the information posted online last week in advance of a public input session scheduled for Tuesday. In addition to meeting the city’s vision for the airport, the consultants also factored in Federal Aviation Administration regulatory requirements, aircraft needs and the development constraints present on the site. Those constraints include steep grade changes, limits of the airport’s property boundary, the locations of Interstate 89 and Airpark Road, the presence of wetlands on the property, neighboring land uses, including residential neighborhoods, and available funding. Airport projects are typically funded 90 percent through the FAA, 5 percent through the New Hampshire Department of Transportation and 5 percent through the city. The city’s share is drawn from passenger facility charges for passengers who get on planes in Lebanon, other airport revenue and the city’s general fund. Though the consultants provided estimated costs for the runway improvement alternatives in their draft report available online, they do not yet have cost figures for taxiway or building improvements. The consultants’ preferred alternatives reflect an attempt to balance the regulatory requirements with the community’s preferences for minimizing the airport’s impact on surrounding areas. For example, in place of standard runway safety areas of 500 feet wide by 1,000 feet long, in some instances the consultants recommend installing an “engineered materials arresting system,” which uses crushable concrete blocks, placed at the end of a runway, that are designed to stop a plane without injuring those on board and causing minimal damage to the plane. Though these systems take up less space than a typical safety area, they still comply with FAA regulations, according to the consultants’ draft report. Currently, only one end of one of the two runways at Lebanon’s airport meet the FAA’s requirements for safety areas. After considering six runway improvement options — including no-build — the consultants selected the sixth option. If the city opts to move forward, this alternative would include adding engineered material arresting systems to one end of each runway. It would also start the beginning of one end of each runway before the pavement begins — what is known as a displaced threshold. This alternative is expected to cost $34.9 million, including a local share of $1.75 million. After considering three taxiway improvement options — including no-build — the consultants recommended reconstructing the pavement on both taxiways and both runways and extending the north-south taxiway south to the end of the runway. The construction would be done in phases so as to minimize the effect on airport operations. The consultants also recommend reconstructing the parking lot and Airpark Road, expanding the snow removal equipment building and the aircraft rescue and fire fighting building and constructing two new hangars — one 16,800 square feet in area and the other 45,000 square feet. Dyment declined to offer his own thoughts on the consultants’ proposals. Instead, he said, his job is to share the information with the public, listen to feedback and move forward. Almy also sits on the city’s Conservation Commission. Prentiss, the city councilor, said she does not want the airport to grow, but would like it to become financially self-sustaining. It’s important to find a way for the city’s residents to coexist with the airport, she said. “The reality is it’s not going away,” she said. Overall, she said, the report does not contain any big surprises. She said she was glad to see there are some alternatives to the standard safety areas, which could have less of an impact on neighbors and the environment. “To know that there are alternatives gives me some peace that we have some options that we can chew on that are going to be better,” she said. In future conversations with the consultants, she said, she would look for more information about what it would take to construct an engineered material arresting system. Prentiss also said the consultants’ report made it clear to her that, while there may be opportunities to grow the corporate sector of the airport’s business, the airport is reliant on the revenue generated by its commercial service. Hitting the 10,000 mark for passengers getting on commercial planes in Lebanon in 2015 makes Lebanon eligible for $1 million through the U.S. Department of Transportation’s Airport Improvement Program in 2017. Cape Air spokeswoman Amanda Carlo said the company aims to meet the goal for the fifth straight year in 2016. “We’re really thrilled that we keep showing that there’s a lot of interest in (traveling to the Lebanon) area,” Carlo said. Cape Air operates daily flights between Lebanon and Boston and Lebanon and White Plains, N.Y. The White Plains flights include ground transportation into Manhattan. 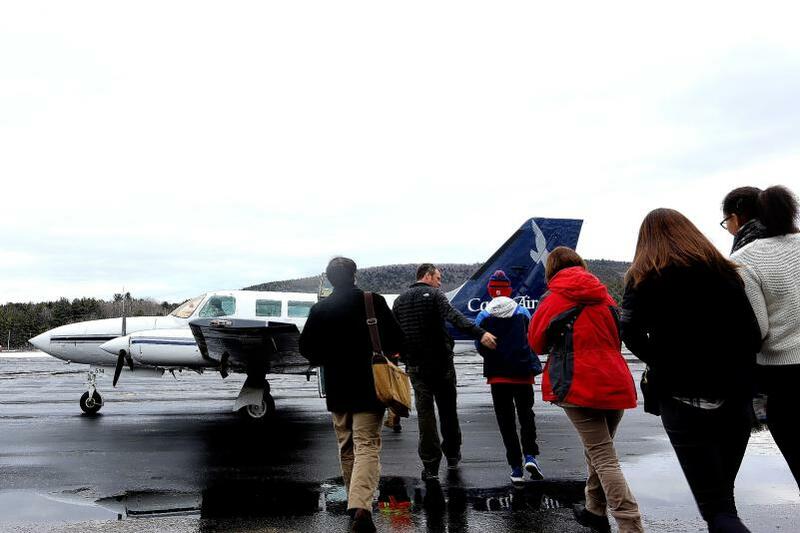 To meet the goal in 2015, Cape Air began offering discounted flights in June. Some fares from Lebanon to Boston were discounted to $49 each way, down from a regular price of $72.10 or more. Some fares to White Plains, N.Y., were discounted to $99 each way, down from a regular price of $136.50 or more. In celebration of reaching the 10,000 mark, the airport and Cape Air will offer free refreshments to passengers and airport visitors this week. Overall, the master plan consultants predict slight growth in the number of people leaving from Lebanon on commercial flights from 10,800 in 2015 to 13,600 in 2030, and similar growth in the total number of planes — private, military and commercial — taking off and landing in Lebanon from approximately 29,800 in 2015 to 31,800 in 2030. This growth is consistent with previous forecasts and with national trends. Tuesday’s airport master plan public input session is set to take place at the Kilton Public Library in West Lebanon at 6:30 p.m.
Those who are unable to attend the session are invited to submit comments via email to dstoddard@mjinc.com or via mail to McFarland Johnson, LEB Comprehensive Airport Master Plan, 49 Court St., Metrocenter, P.O. Box 1980, Binghamton, N.Y. 13902-1980. Comments will be accepted until Jan. 19. More information about the airport master plan is available at http://fly.lebnh.net/masterplan. Eight Cape Air passengers board a full-capacity noontime flight bound for New York City at Lebanon Municipal Airport in West Lebanon, N.H., on January 2, 2016. The airline flew over 10,000 passengers from Lebanon in 2015, which qualifies the airport for a $1 million federal subsidy in 2017.